P. mag. copt. Saqqara hypogees F17.10 (10th-11th century CE) – a magical text written on a small piece of paper, and found during the excavation of the mastaba of Akhet-hetep in Saqqara. Our last post in this series established two categories of magical manuscripts – formularies, which contain magical recipes, and applied texts, created in the process of magical rituals and embodying their power. We deliberately chose a very clear example to illustrate this division, but in many cases the line between the two is not so obvious. This week we’ll look at a few confusing examples of magical objects which show features of both formularies and applied texts. There is wind when there is no wind. There are waves when there are no waves. It is Iao who unbinds you. It is Adonai who sets you free. It is Eloe who provides you the way to be redeemed in this very hour, you, NN. Here we see the generic name-marker, NN, which shows where the name of the individual for whom the charm was performed should be added, usually a sign of a recipe from a formulary. But, because of its small size, and the fact that it was folded many times to form a tiny package, van der Vliet suggests it was actually an applied text. There is therefore a conflict between our textual and material criteria for classification, and so we must try to understand this manuscript holistically, and think of explanations for this contradiction. If it is an applied amulet, the copyist might have left in the generic name marker either by accident, because they didn’t realise they needed to insert the actual name, or deliberately, creating a generic amulet which could be given to anyone. If it is a formulary, it might have been folded for transport or disposal, or even to be re-used as a magical text. If we turn to other objects, we can see clearer examples of both of these possibilities. While we haven’t discussed magical gems before in detail, these artefacts are another form which applied objects might take, and they have been found in their thousands around the Graeco-Roman world. Because they were intended to be worn on a ring or a necklace, magical gems are, almost without exception, applied texts, and yet they occasionally contain some of the identifying features of formularies – titles, instructions, or the generic name marker. A hand drawing of CBd-2925, a magical gem intended to heal a uterine complaint. Put the womb of NN in its proper place (in the same way) as (the sun god moves) the solar disk. Here we see a clear example of an applied text which has copied the generic name marker from its model. As Campbell Bonner, the grandfather of magical gem studies, pointed out, even if the carver didn’t want to insert the wearer’s name, it would be normal to insert a different generic phrase, “the one who wears this”, rather than retaining a bare NN. Watch and protect the four sides of the body and the soul and the spirit and the whole house of NN and her child who is in her womb, as well as every child which she bears. Give long life without any disease. Cast forth from her every evil force! Do not ever allow them to approach her, or any of her children who she bears. Cast forth from her every doom and every numen and every Apalaf and every Aberselia and every power of darkness and every evil eye and every eye-shutter and every chill and every fever and every shivering! Master them all! Cast them away from her and away from all her children that she bears, and away from all her dwellings, quickly, quickly! Do not allow them to approach within two hundred miles of her, ever, or of the child with whom she is pregnant! Part of British Library Ms. Or. 5525 (Cairo, 9th-11th century CE? ), an invocation to protect a pregnant woman and her children. The section here shows part of a stylised, but damaged, image of an angel. The name of a specific woman, Soura daughter of Pelca, has been written across the angel’s chest, and to the left of his body. As we can see, this text contains the generic name marker, and this, as well as its large size – 37 cm high by 23 cm wide, larger than an A4 sheet of paper – suggest that it may originally have been a formulary. Yet it has has been transformed into an amulet by another writer, or perhaps the same writer using a different pen at a later date. This editor has added the name of a woman – Soura daughter of Pelca – throughout the text. Her name is written at the end of each section, and even inside the body of the angel. This apparently wasn’t enough for this writer, since he proceeded to recopy this section onto the back, replacing NN with Soura’s name. 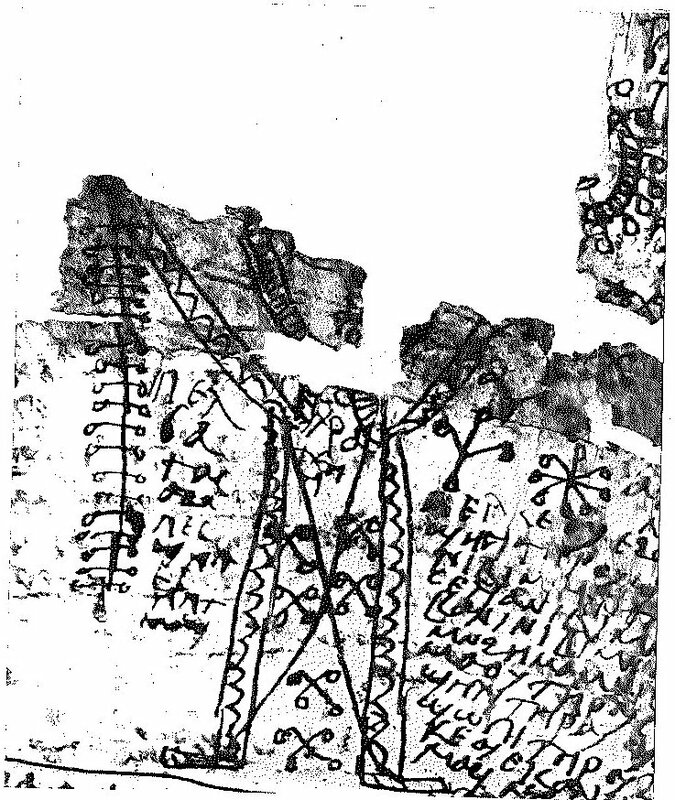 The text was then folded numerous times, just as smaller amulets would be folded, to form a small, portable package. The categories of formularies and applied texts are useful for understanding the processes of ancient magic, and for making sense of the manuscripts which attest to it. But the three examples chosen here show some of the ways in which the seemingly fixed boundaries between the two categories can be crossed. In some cases, manuscripts may simply be too ambiguous to be easily classified. 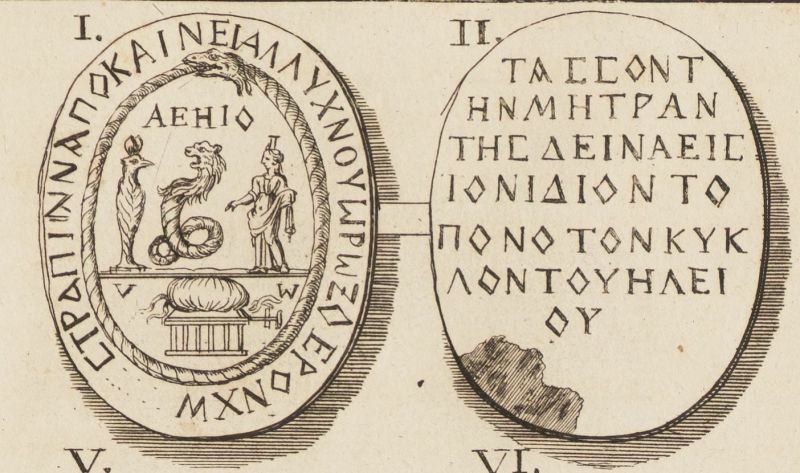 In other cases, inexperienced or uncareful copyists might accidentally reproduce parts of formularies onto amulets that they were meant to omit. In a few rarer examples, as in the amulet to protect Soura, we even find magical recipes being appropriated, and transformed directly into magical objects. A fantastic website cataloguing information about and images of hundreds of magical gems. The example discussed here is no. 2925 in the database. The classical work on magical gems. Bonner describes an example of a gem into which the generic name marker has been miscopied on p.50. An article discussing other examples of magical gems which show features probably copied by mistake from handbooks. Jordan, David. “Notes on Two Michigan Magical Papyri”. Zeitschrift für Papyrologie und Epigraphik 136 (2001): 183-193. An article discussing examples of Greek texts which blur the line between formulary and applied texts. Kropp, Angelicus. Ausgewählte koptische Zaubertexte. Übersetzungen und Anmerkungen. Vol. 1, Bruxelles: Édition de la Fondation Égyptologique Reine Élisabeth, 1931, no. C, pp. 15-21. 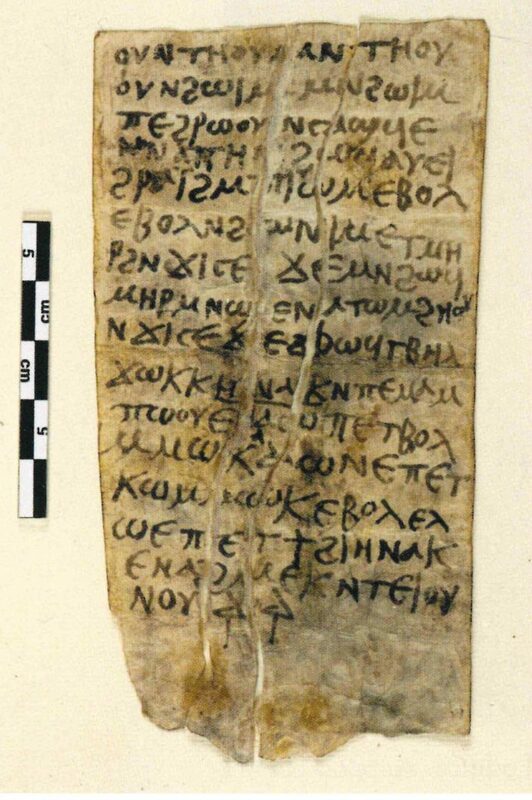 The Coptic text of British Library Ms Or. 5525 is published in this volume as text no. C.
Meyer, Marvin W., and Richard Smith. Ancient Christian Magic: Coptic Texts of Ritual Power. Princeton (New Jersey): Princeton University Press, 1999, no. 64, pp. 120-124. A translation of British Library Ms Or. 5525 is published in this volume as text no. 64. Article containing text, translation and discussion of P. mag. copt. Saqqara hypogees F17.10.